Bill Higgins is the kind of man who knows what he wants. Right down to the very last detail, in fact. After years spent in the aeronautics industry, designing custom aircraft interiors for clients including royal families and heads of state, Bill is eminently qualified to lay out his vision of the perfect motor yacht. That, of course, is where Huckins comes in. It's very efficient. It planes on one engine, it stays on plane between 18 and 34 knots and it tracks like an arrow. It's absolutely remarkable. Recently we visited with Bill and his wife Polly aboard their custom-built Linwood 56, Integrity, Huckins' first jet drive model launched in 2006. As you might expect, given Bill's background, choosing a yacht builder to bring the couple's vision to life was entirely by design. 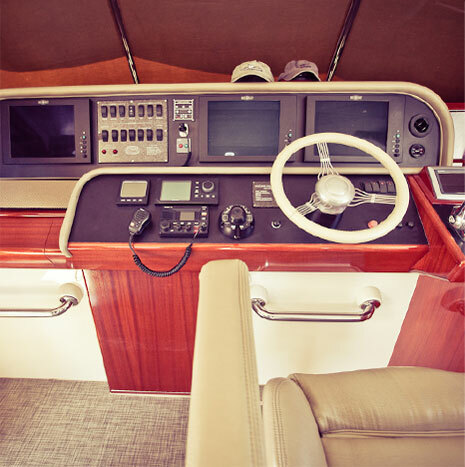 Huckins' head-turning combination of retro elegance and modern composite materials (Bill is a composites expert), along with outstanding open-water performance at a wide range of speeds, provided the basis for a very informed decision. "It tracks extremely well," Bill explained. "It's very efficient. It planes on one engine, it stays on plane between 18 and 34 knots and it tracks like an arrow. It's absolutely remarkable. People always ask, 'Why aren't other boats built like this?' And I always have the same response: Why aren't other cars built like a Porsche?" 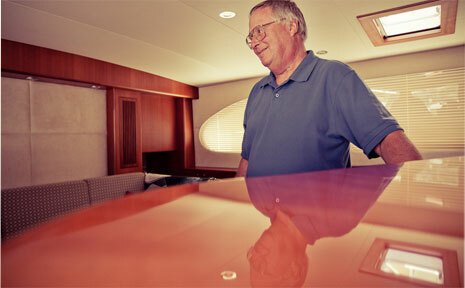 Bill was involved in the design process every step of the way and enjoys pointing out custom touches that make Integrity, like all Huckins yachts, as unique as its owners. These include double-paned windows to control noise and temperature (with electric blinds mounted between the dust pane and the glass), separate A/C controls in every room, stackable bi-fold doors and curved cabinetry to maximize space, seating made perfect for lounging or raising to an inclined position for reading, his & hers heads with a shower between the two, and a coffee/dining table featuring a triple-adjustable pedestal and additional leaf to accommodate seating for 6. Even the interior woodwork consists of one flitch of Makore, with matching grain cut from a single tree. The only thing missing, some might say, is a television and even that is by design. "We are readers," Bill told us. "One of the joys both my wife and I share is we just love to read books." Huckins owners like Bill and Polly certainly value individuality, but they also appreciate the process—the collaboration, commitment and craftsmanship—involved in building a custom yacht. Especially when the process helps eliminate snafus and surprises from beginning to end, including Bill's final bill, which turned out to be exactly what was agreed upon two years earlier. Quoting Bill, "I know there were some upgrades Huckins made to make the boat better and when I asked about it they said, 'Well, our philosophy is to always make the boat better than what the customer expects.' I got my boat better than I expected." Perhaps, even in the process of creating a custom motor yacht, experiencing the unexpected now and then can be a good thing. "One of the wonderful things about owning a Huckins," according to Bill, "is that you are actually part of a Huckins family." Buddy and I couldn't have said it better ourselves, and we couldn't be happier to have people like Bill and Polly Higgins upholding the family tradition with Integrity.